Whites Aviation produced hand coloured photographs of New Zealand for around fifty years. When they began in 1945 colour photography wasn’t accessible as it was only in its infancy so the hand coloured photographs they sold were very popular. These now iconic images can be found in cafés like Replete in Taupō orVudu in Queenstown. This very large photograph that was recently donated to the library is 1100 x 2520 millimetres and formerly hung in the Auckland Star building. Ref: Whites Aviation, Auckland, c1965, Sir George Grey Special Collections, Auckland Libraries, 1411-1. Now on in the J.T. Diamond Room, Waitakere Central Library is our Dalmatians out westexhibition. The exhibition features images from Auckland’s Dalmatian community and will run until 30 August 2016. This is the third and final blog post based on the themes in the exhibition. A number of Dalmatian families specialised in transport or earthmoving companies. The Lendich family were by far the largest, followed by Vuksich & Borich and then Bogoslav Sokolich. 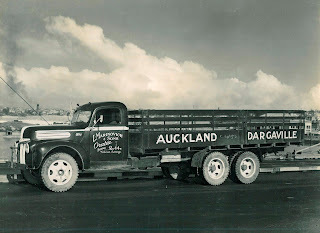 Marinovich and Sons also owned a fleet of transport trucks which plied the route between Dargaville and Auckland. Ref: Marinovich & Sons’ truck for the Auckland-Dargaville Service. West Auckland Research Centre, Auckland Libraries. DGHS Collection. Ref: Tony and Ivan Yukich standing in front of their new truck, c1998, West Auckland Research Centre, Auckland Libraries. DGHS Collection. In today’s property market most young couples can only dream of such a wedding gift, but when Julia Thorne George married up-and-coming lawyer Wilfred Colbeck in June 1895 her parents presented her with a house in St Stephens Avenue, Parnell. 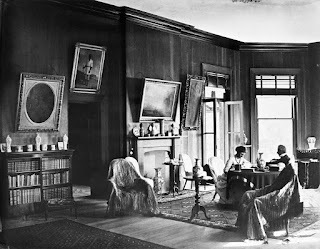 What’s more, Sir George Grey sent her a generous cheque that enabled her to furnish the dining room in style. She was nevertheless miffed at Sir George for failing to attend the wedding. Technically, he was her great-uncle, but she regarded him more as a grandfather. She had lived in the same house as him most of her life. Her mother, Annie, was the daughter of Grey’s half-brother Godfrey Thomas, who died young. Grey not only took Annie in but continued to provide a home for her and her growing family after she married Seymour Thorne George in 1872. Ref: Daniel Mundy, Interior of Mansion House, Kawau Island, c1870, Sir George Grey Special Collections, Auckland Libraries, 7-A3034. Inspired by a recent post on the New York Public Library's blog the team at the South Auckland Research Centre have chosen a selection of their favourite photographs from the collections there. 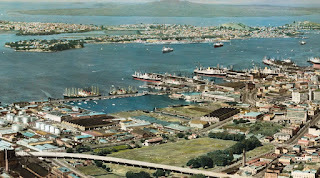 Their choices span a century, from the 1890s through to the 1990s, and show a variety of places around South Auckland and the Counties Manukau area. The Auckland Libraries Footprints database includes a wide range of captivating and illuminating photographs. It’s difficult to make a choice of favourites, but here are three that stand out in my memory. Ref: Racing boy, Pakuranga, c1905, photograph reproduced courtesy of Howick Historical Society, South Auckland Research Centre, Auckland Libraries, Footprints 39. 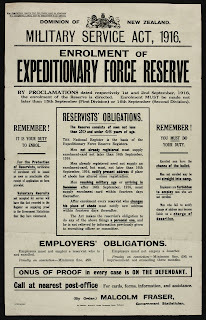 One hundred years ago today, 1 August 1916, conscription was introduced to New Zealand through the Military Service Act. The first names were drawn under the Act on 15 November 1916, and monthly ballots were repeated for the remainder of the war. As you can see from the poster, there were serious consequences for those who did not enrol. Ref: Flyer. Military Service Act, 1916. From: Lusty family. Collection of newspapers and ephemera, Sir George Grey Special Collections, Auckland Libraries, NZMS 1387.